From the term multi (meaning more than one) we deduce that multimeters are meters/electronic tools with abilities to perform more than one function. Multimeters are used to test, troubleshoot and fix electrical devices and equipment. 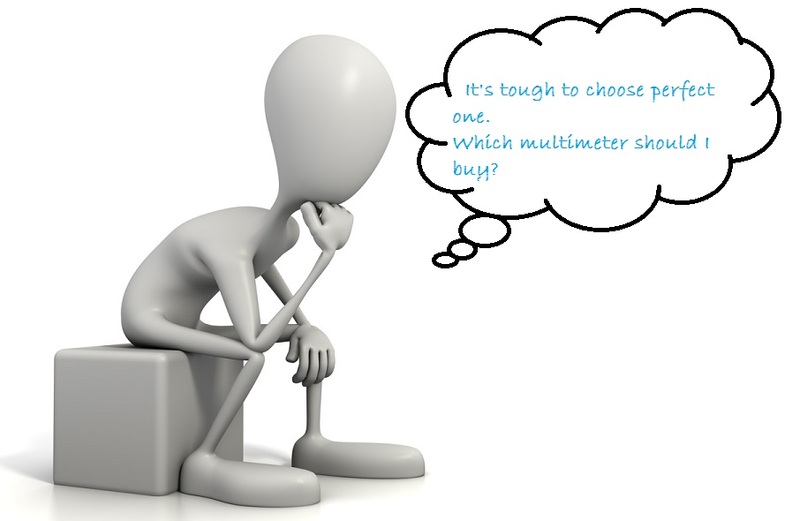 Choosing the ideal, appropriate multimeter requires you to consider various factors and elements. What are some of these factors? What is it that you should look out for when choosing a multimeter? Continue reading this article to get tips and ideas on how to choose a multimeter. First of all, as a buyer you have to identify why you need a multimeter and the areas you intend to apply its use. Keeping in mind that different multimeters have different abilities, features and functionalities, be clear about why you want a multimeter. If you intend to use your multimeter in complex applications like commercial buildings or industries then it is advisable to go for an advanced multimeter with highly developed features and functions like the Fluke 87 V. On the other hand, simpler applications like household applications do not require too much in terms of features. In this case, a basic model can work perfectly effectively. Price varies with the brand, model and its features. If you want an advanced multimeter then you will pay nothing less than $100. But again, there are the calibrated multimeters that you can calibrate to restore accuracy and efficiency (factory’s settings) after some time. There are also the non-calibrated models that you will have to replace once it loses accuracy. Calibrated models are relatively expensive as you will incur the purchasing cost and also maintenance costs. The non-calibrated models are cheaper. The choice of either a calibrated one or one that is not calibrated is yours to make. Which model do you want? Are you ready to keep up with the calibrated costs? Once you can answer these questions, then you are ready to choose a multimeter. Before choosing a multimeter or any electronic device, it is important to know and understand some of the features it contains. It is also important that you decide whether you want a digital multimeter or an analogue multimeter. Both are functional but a little different. Depending on what you want, understand the features that mean most to you and seek them out. A good multimeter should be able to measure volts, frequency, resistance, continuity and have a diode checker. A multimeter with auto-ranging provides you with flexibility in terms of voltage settings. Other features include a screen display (LCD or LED). Advanced models come with a backlit screen feature that allows you to use it even in poorly-lit areas. Some other models have advanced features like low pass filters that prevent unwanted voltages during measurements or data logger which allows for later use of readings by graphical display. Bearing in mind that meters are used in tandem with electricity, safety should always be uppermost in your mind when choosing a multimeter. However, not all multimeters have safety guarantees. Each one depending on brand and quality comes with its own particular safety protection. Depending on your area of application, choose a multimeter that is adequately protected so that you don’t fall victim to electric blasts or shocks. Consider things like the energy capacity of circuits and voltage ratings. Most multimeters span the CAT safety ratings ranging from CAT I to CAT IV. This enables you to evaluate the maximum voltage a multimeter can withstand. Moreover, it is necessary to consider multimeters with third party safety testing; this assures you of how far the manufacturer has gone to ensure that the device is safe for use. To find out if a device has third party safety certification, look at the back of the meter for symbols/logos for certification such as CAT or CE. Multimeters come in various brands (FLUKE, AMPROBE, ALIGENT, EXTECH, INNOVA). All these are good brands. Fluke is arguably the most trusted in terms of quality. In conclusion, how to choose a multimeter is quite simple: it all depends on how much time, finance and energy you are willing to dedicate to finding the perfect multimeter for you.